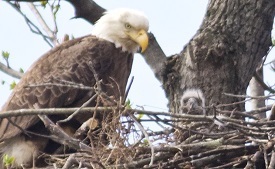 Many people are stopping on the trail to observe the nest. The recovery of the bald eagle in the lower 48 U.S. states, after being listed under the federal Endangered Species Act, is a conservation success story nationally and in Dyke Marsh. Photos by Ed Eder.